Buy 2 Guns cheaply from Amazon or read more articles on film and television. You too can earn money from writing articles by signing up for InfoBarrel. 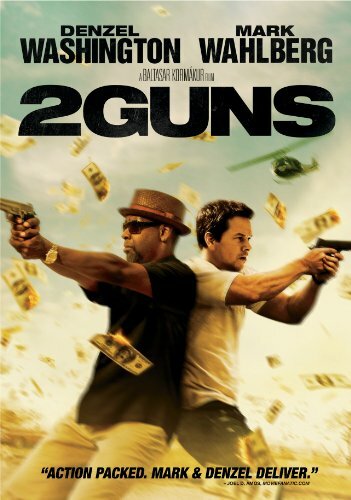 2 Guns is based on a graphic novel series of the same name. Michael "Stig" Stigman (Mark Wahlberg, Contraband, Ted, Transformers: Age of Extinction) and Robert "Bobby" Trench (Denzel Washington, Safe House, The Equalizer) decide to rob a small town bank, Tres Cruces Savings & Loan, in order to steal an estimated $3 million that Mexican drug lord Papi Greco (Edward James Olmos) has stashed away there. After successfully robbing the bank, they find much more money than the about three million they expected. Instead, there is about $40 million in cash. Credit: https://en.wikipedia.org/wiki/File:Two_guns_poster.jpgThis isn't just about two criminals committing an unexpectedly successful crime, as neither of the two is actually what he seems. Bobby is undercover DEA (Drug Enforcement Agency) and Stig is a Petty Officer in US Naval Intelligence, also undercover. Both were conducting operations against Papi Greco, although of different types. It also turns out that the money they stole was not the drug lord's but was actually a slush fund operated by the US Central Intelligence Agency. As a result of this, they end up being pursued by the CIA, led by Earl (Bill Paxton, Edge of Tomorrow, Nightcrawler), who want their money back, by the drug lord Papi Greco and finally by Stig's people at Naval Intelligence. To add a further incentive, Bobby's colleague and sort of girlfriend Deb (Paula Patton) is captured by Greco. Bobby and Stig don't exactly get along all the time, even when they are no longer playing the criminal roles with each other after discovering that they both were working undercover, but it's a kind of friendly not getting along. The general plot of 2 Guns is pretty formulaic, although there are more parties interested in the money than is more usually seen. Being chased by three different sets of people is more than would be normally expected; on or two sets of antagonists is more common. As a consequence of the fairly standard plot, how well the film works largely depends on the dynamic between Bobby and Stig as this is basically a buddy movie. If the interplay between the two characters/actors hadn't worked, this would have completely killed the film. Fortunately for 2 Guns it did. This may be an action film but there are definitely strong comedy elements, even through the fairly high levels of violence. The humour present is partly because of Stig's tendency to make a joke out of everything, even, or especially, when it irritates Bobby, whose responses contribute much of the rest. The film has a pretty unflattering image of the CIA, showing them as law-breaking (and law-ignoring), violent and totally ruthless beneficiaries of the drug trade. This is admittedly not the first time they've been portrayed, or outright accused of, having a hand in the drug business. 2 Guns is a decent, enjoyable action comedy that was made better than it could have been simply by the performances of, and the interactions between, the characters of Washington and Wahlberg.